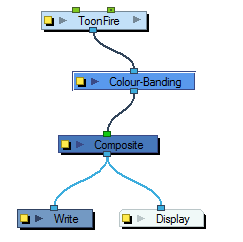 In this example, a Colour Banding module has been connected to a fire created with particle effects. Use the Colour Banding effect to add a colour banding visual effect to your elements. The module will associate a flat colour to the different regions of your element. These regions are delimited according the alpha values that are set up in the effect module and which will be recognized on the original element. You can use this effect to change the visual style of a particle module, for example, by giving it a more cartoonish look. Use the Colour Banding layer properties dialog box to set up the colour banding effect. In the Colour Banding layer properties, you have four sections with which to set up the four different regions alpha and colour override values. This is how the regions range are calculated. 1. Threshold 1: Use this first threshold field to determine the first region outer limit. A value of 0 represent an alpha of 0 which is completely transparent. A value of 100 represents an alpha of 255 which is completely opaque. If for example, you enter a value of 5 for the first threshold, the region of your element which is within the range of alpha going from 5% to the Threshold 2 value, will be coloured with the Area 1 colour value. 2. 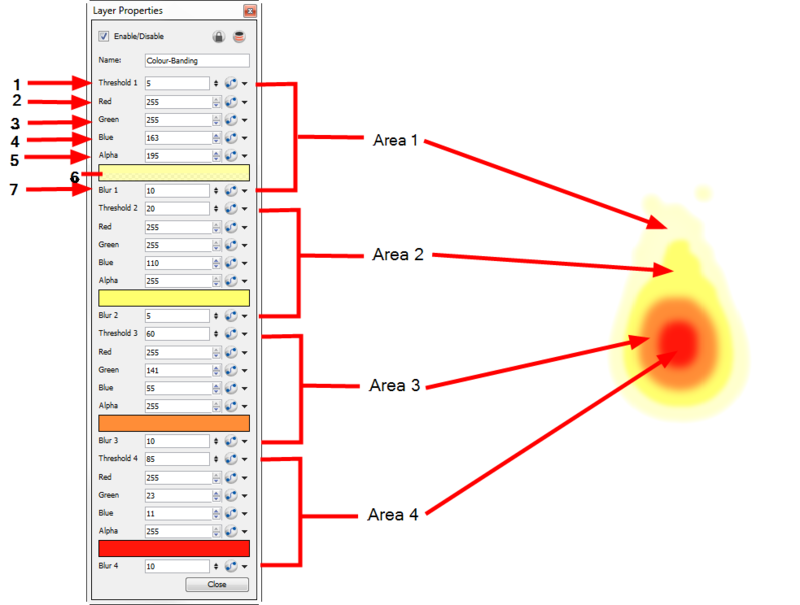 Red: Use this field to manually enter the value of red for the first region colour. 3. Green: Use this field to manually enter the value of green for the first region colour. 4. Blue: Use this field to manually enter the value of blue for the first region colour. 5. Alpha: Use this field to manually enter the transparency value for the first region colour. 6. Colour: Click in this colour space to open the Colour Picker dialog box and select a colour for the first region. 7. Blur 1: Use this field to add a blur effect to the edge of the first region. The three other sections will set up the regions two, three and four.